On 16 August last year we drove out of the UN Palais des Nations and headed east. 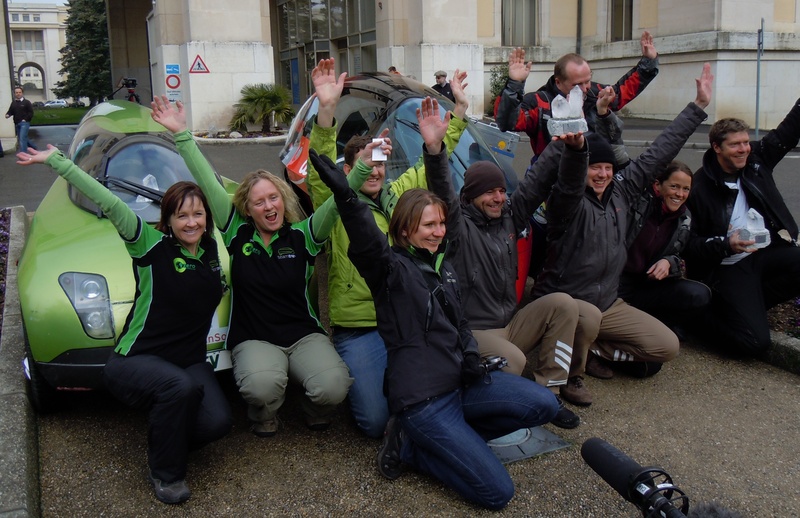 Yesterday at 11:00 am, after 80 days of driving, we arrived back at the Palais, having driven around the world. Our aim in building Trev, and in driving around the world in Zero Race, was to demonstrate that it is possible to build practical vehicles that use clean energy, and use a lot less energy than conventional cars. We have driven from Geneva to Shanghai, from Vancouver to Cancun, and from Casablanca back to Geneva. We have driven across deserts and across mountains, through remote rural areas and through some of the world’s largest cities, on all types of roads, in all types of weather. The energy cost of the journey was less than $400 worth of electricity generated from a wind farm. The net emissions were zero. Australians are amongst the world’s highest emitters of CO2, per person. Our energy use is high, and we generate almost all of that energy from fossil fuels. Over the next 40 years we need to reduce our per-capita emissions by 95%. To achieve this, we need vehicles like Trev. Over the next few days will will give Trev a good clean, pack it into a crate, and ship it back to Australia. When it gets back, we will continue refining it to make it more comfortable (it is quiet outside the car, but not so quiet inside the car), more efficient (there are still some efficiency improvements we can make to the motor controller), and easier to build. It is not yet ready for the showroom. But it has shown what is possible, and hopefully will make people think about how they will get around in a future without cheap oil and with an atmosphere that cannot take any more CO2. This entry was posted in Events, Zero Race. Bookmark the permalink. Great to hear you made it–and what impressed me most–$400 worth of electricity generated from wind and the net emissions were zero. Congratulations team and a big thank you for representing Australia so well. Carbon Business, Adelaide. Congratulations Team Trev!! !I would like to put my name on the waiting list to buy one of your electric cars.As i have solar power on my roof i would never have to go to a petrol station again. Brilliant.! Fantastic.! Hearty Congratulations for yr endeavours. I’m looking forward to being able to purchase a kit, assemble it, and drive quietly and pollution free around town. This was a little step on moon but a great for mankind… I hope this was not the last world-around-race from you. Congratulations!!! Besten Dank dass ihr am Rennen mitgemacht habt. Ihr habt gezeigt, dass auch Elektromobile mit grossen Reichweiten möglich sind. Gratulation zu euer grossen Leistung. Congratulations! Safe travel back to Oz! Congrats to the TREV team for another fantastic accomplishment! We’ve shared this with almost 3,000 people via Greenfleet’s monthly “technology e-news” this morning. Thank you for sharing! What an amazing feat. I’m so glad that you not only were successful, but that you found thing upon which to improve. Good for you! Thank you for a fine example of light weight and streamlining as opposed to the armoured tanks we are currently using! The right direction to susainablity.